What if you could buy a new disc, or set of new discs, near the first tee of your local course? Would you do it? It’s no longer a rhetorical question. 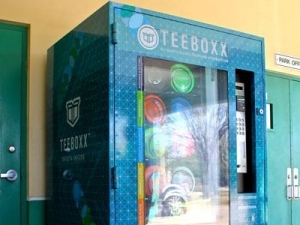 In March, Omaha-based TeeBoxx installed its first automated retail center, or “pro shop in a Boxx” at Kendall Indian Hammocks Park in southwest Miami. Stocked with new discs from leading manufacturers, players, and those interested in trying the sport, are now able to stock up on the company’s “fly gear,” before hitting one of the park’s two 18-hole courses. TeeBoxx has received a warm reception on the ground in Miami, and word is spreading fast through the disc golf community. TeeBoxx founder and Chief Marketing Officer, Aaron Martin, says TeeBoxx is a mission-driven organization and that proceeds from every purchase made at a local park go to help support the park, at a time when parks desperately need funding. Martin, and partners Ross Brandt and Justin Cherry, has been inundated with requests for information since launching in March. It is a good problem for entrepreneurs to have, and the team is working hard to place their new automated pro shops at high traffic courses, and respond to all the interest pouring in from disc golf clubs, course architects, Parks & Rec departments, corporate events staff and from players around the globe. TeeBoxx partners with interested parties at local Parks & Rec departments first and foremost, entrepreneurs, and retail companies governed by one of two programs based on specific geographic criteria. High traffic courses (or Premier Locations) that have more fund raising potential – being the priority in the companies business model – can choose to receive a TeeBoxx with nearly no upfront costs and a split in profits. All other locations have three and five-year leasing options making it affordable and available to any qualified party with good credit. Lessees can stock the TeeBoxx with their own inventory or buy from TeeBoxx at a competitive wholesale price. In either case, TeeBoxx provides the payment processing software, customer data, plus the legal and technical support, insurance and maintenance to make it all work seamlessly. “A lot of people ask about security,” says Martin. It makes sense when you see what’s inside the TeeBoxx – rows of flying objects that want out! There’s no perfect solution he says, but the glass is shatterproof and the company’s second generation pro shop will feature a breach sensor that automatically drops a protective casing to safeguard the contents. Also, it helps that no cash is used in the transactions. TeeBoxxes also come loaded with a security camera, and alerts can be delivered by email or text. “I’m certain we haven’t thought of everything, but we’re willing to learn as we go and grow the company by improving our service and our product at every turn,” says Martin. In case you’re wondering you may have heard of these guys before. Brandt is a sponsored player on Team Vibram. Martin, until recently, was a sponsored player with Discraft. TeeBoxx plans to sponsor pro players in the future. “We’re doing this because we love disc sports. It’s really the only way to go about launching a new company. It’s an all-encompassing pursuit,” says Martin. TeeBoxx is a mission-driven company working to promote disc sports by providing the latest equipment at the point of play. TeeBoxx partners with Parks and Recreation Departments to help fund the parks where disc sports are played with a new and vital revenue stream. Customers can also purchase disc sports equipment and learn more about the disc golf, freestyle and ultimate at TeeBoxx.com. Expecting a break in the weather, Volo Disc Sports is hosting the Jekyll & Hyde Classic disc golf tournament on Saturday and Sunday, April 27 and 28, in Norfolk. The event is sanctioned by the Professional Disc Golf Association (PDGA) with a draw of players from several states. This is the third stop of the Volo Ocho disc golf tour across Nebraska this season. Two rounds of will be played at the River Run Disc Golf Cours in TaHaZouka Park on Saturday followed by a players party Michael’s Cantina. Sunday morning competition will continue with two rounds at Skyview Park Disc Golf Course. $1,000 bonus has been added to the prize pay out to the professional divisions. Registration is available in person at TaHaZouka Park beginning at 7:30am on Saturday or in advance at volodiscsports.com. Cost ranges from $20 for players under 16 years of age in the amateur division to $60 for the Professional Open division. As a course preview a team doubles tournament is scheduled at Skyview Park on Friday, April 26, beginning at 4:00pm. Disc golf is played much like traditional golf. Instead of a ball and clubs, however, players use a flying disc, or Frisbee®. The sport was formalized in the 1970’s and the course at Skyview Park was installed in 2002 followed by the River Run disc golf course at Taha Zouka Park. There are over 70 courses in Nebraska hosting over 40 tournaments. Players range in age from school age to seniors making it one of the greatest lifetime fitness sports available. Because disc golf is so easy to learn no one is excluded. Beginners start with one or two discs costing as little as $12 each. Volo Disc Sports is an online disc sport retailer in Nebraska. This colorful weather map of Nebraska with disc golf courses shows there is simply no where to avoid the cold. Week day leagues have been cancelled keeping putts in the garage. Will this help to bring May flowers?